Silicon Valley flexes protest muscles at Pi Day rally - We Resist. 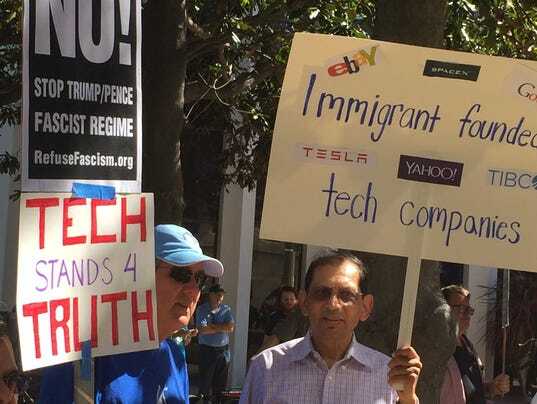 PALO ALTO, Calif. — Silicon Valley workers flexed their political muscles Tuesday at a Pi Day rally in protest of President Trump’s immigration policies. 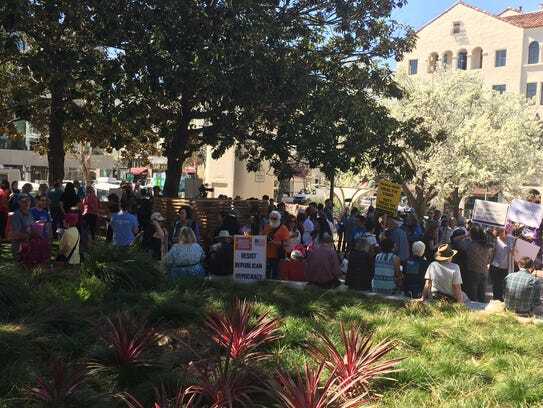 The organization said 1,700 people had signed up on Facebook to attend the rally in the heart of Palo Alto, just down the street from a row of tech start-ups venture capital firms. More than two dozen speakers — including Maria Gonzalez, a janitor at Facebook, and Aatif Awan, vice president of growth and international at LinkedIn — were to speak at the four-hour event. As tech workers left work, more gathered in a small park ringed by camera crews. They say they’re gathering support for the values that drive Silicon Valley — diversity, the open exchange of ideas, meritocracy and civil liberties. 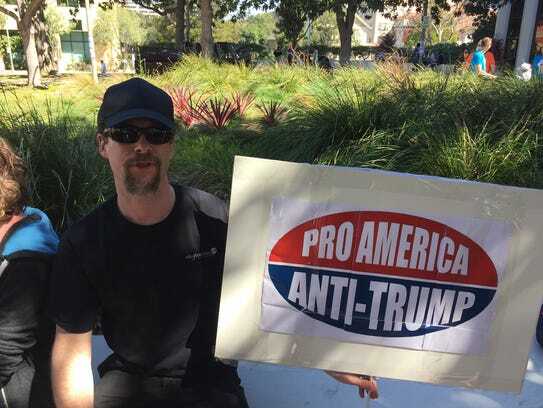 “I’ve been really alarmed at how Trump is running the country, and it’s consequences worldwide,” says Ron Dorn, a Salesforce.com software developer who lives in Pleasant Hill, Calif. Among those taking part in the event are employees from Facebook, Apple and Google. Pi Day is marked on March 14 at 1:59, when the date and time are the same as the mathematical constant that describes the ratio of a circle’s circumference to its diameter, or 3.14159. The Tech Stands Up rally is being held in Martin Luther King Jr. plaza in front of Palo Alto’s City Hall, in the heart of Silicon Valley. Gonzalez addressed the crowd, “I’m here to speak in support of all immigrants because I am an immigrant,” she said through an interpreter. “We’re seeing ICE raids happening all over California… and children have to watch their parents being deported,” she said. Tech Stands Up is a manifestation of a new wave of activism sweeping the technology industry as it undergoes what some are calling a political awakening. Since the presidential election, Silicon Valley has been rife with protests, rallies and efforts to support immigrants and liberal values many believe are under attack. Tech companies recently banded together to sign on to friend-of-the-court filings in both immigration and transgender suits. The group acknowledges that the tech revolution of the past 20 years has disrupted industries and livelihoods and added to economic inequality, creating discontent that influenced the outcome of this year’s election. “We saw throughout the U.S. presidential election what can happen when people are ignored and left behind,” they wrote. At the rally, tech workers will hear from community leaders and will be able to interact with local and national groups working on what the group terms the root issues that feed the inequality.